So, one of our readers, Lynn, requested a Hat Theme. We're only too happy to oblige. 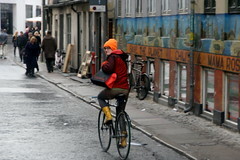 The problem is that I discovered I have so many photos of Copenhageners on bikes wearing hats. Hats are a staple in the winter months here. It would be a mammoth post if I included them all. 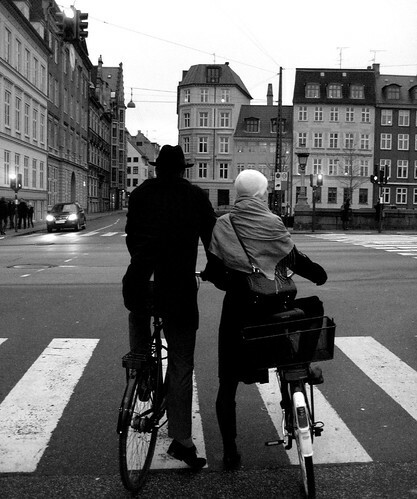 However, one photo from last winter pops into my head whenever I think 'hat' and 'Copenhagen' and 'bicycle'. It's above. A stylish couple at a red light. 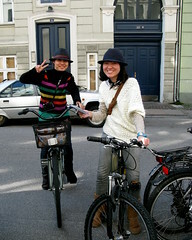 A while back I took this photo of two Korean tourists renting bikes at Baisikeli - the place you have to go if you want to rent bikes in Copenhagen. Smashing outfits the both of them. These two shots were taken a few days ago. 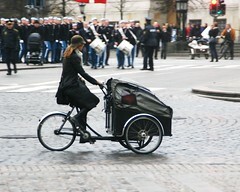 Two cargo bike Copenhagener ladies avec chapeau. The beret is an absolute evergreen. As is the many incarnations of the woolen hat. Here's a splash of colour on a grey winter's day. I believe she was a tourist, speaking another language to the chap behind her. Jumping south to Paris, I simply had to include this brilliant hat - and outfit. And I'll wrap up with this, one of my favourite shots, taken on the City Hall Square. Double hatasticness. And if hats are your funky thang, be sure to visit the Victoria & Albert Museum in London as they have the Anthology of Hats Exhibition running until May 2009. They also have an exhibition about the romance between sports and fashion called Fashion vs. Sport. Now as anyone who reads this blog will now know, urban cycling is transport, not sport. Cycling is a sport to a tiny percentage of the world's daily cyclists. Nevertheless, this exhibition is a fascinating mix of the two and highlights how they influence each other. This exhibition runs until 04 January 2009. "Cykling er ikke kun en transportform, men i lige så høj grad en motionsform"
In English: "Cycling isn't only a form of transport, but also a great way to excercise." I love that. 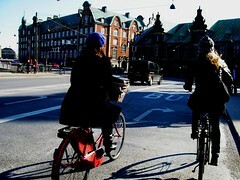 Reminding Danes that cycling is good exercise, too. Beautiful post! Maybe you can do a part II later on in the winter. And thank you for the notice about the V&A exhibition. I was there in August and visited the Supremes exhibit. Looking at the Fashion v. Sport exhibit, it looked a bit too, uh, butch for my tastes. But the hat exhibit looks fab! I should be back to London before May and will endeavor to go. Yay. This all looks like a perfect dream for me. I live and work in Cambridge, UK, where we have US-style H&S liability culture gone insane. In all your photos, not one cyclist is wearing a cycle helmet, yet the Cambridge local authority here will not publish any 'promotional' cycling material with a cyclist in it, if they are not wearing a cycle helmet and 'appropriate clothing'. That means no scarves, long coats, riding with one hand, dark clothing and should include hi-viz clothing. Here in the UK, cycling is presented as a highly hazardous activity, with the need to wear protective gear or else you'll be held partly liable for your injuries if a driver runs you down. It is insane and getting worse each year. Copenhagen sounds fantastic - what's the catch? the same dedication to encouraging people to cycle as in Holland, Germany, Belgium, Japan, etc. is the catch. I commented on your post on the other blog. 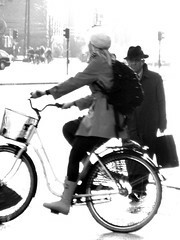 Have a look at Promoting Cycling on Copenhagenize.com. 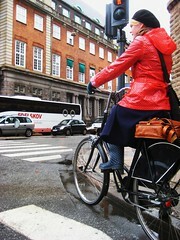 And see how bicycle culture can explode, positively, when you merely concentrate on the bikes, as they have in Paris. Letting people be homo sapiens and not talking down to them.